Yesterday I had the opportunity to visit the David Bowie exhibit at the Brooklyn Museum. It’s an immersive experience that includes audio that changes based on where you are in the museum (similar to the beginning of the book Origin by Dan Brown). While there are a number of great things to take away from the exhibit, one of the things that stood out to me was how much Bowie was influenced by people from all walks of life. 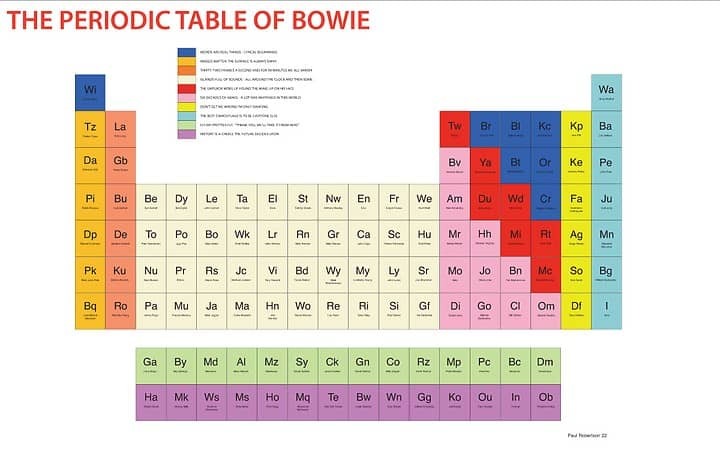 One of the weirder but still interesting pieces was called the Periodic Table of Bowie. Some of the “elements” in the table are people Bowie considered influences. They included other musicians, but also authors like Oscar Wilde, artists like Andy Warhol, and psychologist Carl Jung. What does this have to do with humor? Well not only can we learn how to be funnier from different types of comedians (stand ups, improvisers, cartoonists, sketch writers, etc), but also from other creatives (authors, painters, musicians). For example, one of the biggest influences on my book, the United States of Laughter, was Bill Bryson, a journalist turned incredibly engaging author. Bobby McFerrin, a great jazz vocalist and conductor, has taught me an incredible amount about improv. And my grandmother continues to make me laugh every day. The truth is that the more you experience the world, the more you can add humor to it. What do you think? Do you have any non-comedy comedic influences?